This year marks the tenth anniversary of the publication of my book The Party’s Over: Oil, War and the Fate of Industrial Societies, which has seen two editions and many printings, translations into eight languages, and sales of roughly 50,000 copies in North America. The end of The Party’s Over’s first decade coincides with a widespread re-evaluation of what has come to be known as peak oil theory (which the book helped popularize). So it’s a good time to take stock of both. The following is part memoir, part re-assessment, and part reflection. Prior to the publication of The Party’s Over I was a writer on environmental topics and a teacher in an innovative college program on “Culture, Ecology, and Sustainable Community.” In 1998, I happened to read an article in Scientific American titled “The End of Cheap Oil?” by two veteran petroleum geologists, Colin Campbell and Jean Laherrère. At that time, oil was trading for roughly $10 a barrel—about the cheapest it has ever been in real terms. The article made the case that “When the world runs completely out of oil is . . . not directly relevant; what matters is when production begins to taper off.” The commencement of that tapering, the authors said, could happen disturbingly soon: “Using several different techniques to estimate the current reserves of conventional oil and the amount still left to be discovered, we conclude that the decline will begin before 2010.” History had already shown (in the 1970s) that a significant constraint to the availability of oil could have dramatic and widespread economic, financial, and political repercussions. Around the same time, I began receiving an occasional series of emailed essays titled “Brain Food” by a retired software engineer named Jay Hanson, which discussed energy’s importance in world events. I also joined an email list called EnergyResources. Hanson and others were discussing books like William Catton’s Overshoot and Walter Youngquist’s GeoDestinies, which I quickly devoured. As I began to recognize the central role of energy in human society, big questions I’d had about economic history—especially ones concerning the origins and significance of the industrial revolution—began to find answers. Further, “The End of Cheap Oil” led to the realization that, because humanity was on the cusp of a decline in available, cheap transport fuel, a contraction in trade and economic activity in general was fairly inevitable. I waited for someone to write the peak oil book that would tell the story of energy, portray the politics and economics of petroleum, and lay out the world’s prospects in the coming post-peak era. Surely a petroleum geologist or energy expert would step up to the plate. But none did (with the exception of Kenneth Deffeyes, whose 2001 book Hubbert’s Peak was not quite what I had envisioned). After a couple of years, I started researching the subject in earnest and put together a book proposal, which I sent to Chris and Judith Plant at New Society Publishers. They replied favorably. New Society would go on to become the foremost publisher of non-technical books in the peak oil genre, with titles by John Michael Greer, Dmitry Orlov, Sharon Astyk, and others. In late 2003, I received a speaking invitation from Julian Darley and Celine Rich in Vancouver, Canada. They were in the process of organizing a local peak oil conference, and had just started a new non-profit organization called Post Carbon Institute. They soon invited me to become a board member (and later, Senior Fellow). The next year saw the first of several “Peak Oil and Community Solutions” conferences in Yellow Springs, Ohio (the second one was reported on at length in Harper’s). In 2004 I also attended the Association for the Study of Peak Oil (ASPO) international conference in Berlin, where I met Campbell and Laherrère, Matt Simmons, and other oil experts. The year 2005 saw speaking tours in South Africa and Britain, along with dozens more appearances in the US. Especially memorable was a conference in Kinsale, Ireland organized by Rob Hopkins—who immediately impressed me as someone capable of doing great things (he started the Transition Towns initiative just a year later). That summer New York Times Magazine published a long profile article about Bill Clinton, mentioning that The Party’s Over was on his current reading list and that he had underlined many passages and scribbled comments throughout. Also that year, James Howard Kunstler published The Long Emergency, which introduced an even wider audience to the dilemma of oil depletion. By 2006 it was possible to speak of a peak oil “movement”: Totnes in the UK had become the world’s first Transition Town; both ASPO International and ASPO USA were holding annual conferences to highlight relevant technical issues; the Arthur Morgan Institute for Community Solutions was hosting annual peak oil gatherings in Ohio for the activist crowd; several peak oil websites, including TheOilDrum.com and EnergyBulletin.net, reported brisk traffic; the list of peak oil books and peer-reviewed papers was lengthening; and a growing roster of public speakers was lecturing on the dim prospects of the oil industry and the dimmer prospects of the world’s oil-dependent economies. My personal career morphed in tandem: I moved from teaching to a full-time position with Post Carbon Institute. When I wasn’t on the road speaking, I was writing more books—Powerdown (2004), The Oil Depletion Protocol (2006), Peak Everything (2007), Blackout (2009), The End of Growth (2011), and Snake Oil (2013)—as well as blogs, articles, essays, reports, and forewords to, or endorsements of, other authors’ books. A thrilling decade it was. And here we are now . . . with press articles appearing almost daily featuring some variation of the title, “Peak Oil Is Dead.” What the hell happened? Re-Assessment: Was (or Is) the Party Really Over? The central claim of many recent “Peak Oil Is Dead” articles is that peak oil theorists were simply wrong. Were we? Well, let’s use The Party’s Over as a representative example of peak oil literature and see. I re-read the book (for the first time in several years) as preparation for writing this essay, and the following are a few critical notes. Chapters 1 and 2, which tell the tale of energy’s role in ecology, history, and the economy, are the book’s foundation. Leaving aside the question of how skillfully it’s presented, it still impresses me as a story that deserves to be known and understood by everybody. There’s very little that needs revision here. Chapter 3, which explains peak oil, is pivotal to the book’s overall argument. By current standards, much of this material is simplistic and dated. I fixed some problems in the revised 2005 edition, but that version itself is now stale. The Party’s Over doesn’t offer an original analysis of oil reserves or production data; instead it surveys the forecasts of “peakists” who were active at the time, many of whom are now less active or deceased. The most obvious criticism that could be leveled at the book today is the simple observation that, as of 2013, world oil production is increasing, not declining. However, the following passage from page 118 of the 2003 edition points to just how accurate the leading peakists were in forecasting trends: “Colin Campbell estimates that extraction of conventional oil will peak before 2010; however, because more unconventional oil—including oil sands, heavy oil, and oil shale—will be produced during the coming decade, the total production of fossil-fuel liquids (conventional plus unconventional) will peak several years later. According to Jean Laherrère, that may happen as late as 2015.” On page 121 of the book I explicitly endorsed the forecast of a peak sometime in the period between 2006 and 2015. From today’s perspective that’s still an entirely defensible assessment of global oil supply prospects. Worldwide production of regular, conventional oil (excluding deepwater oil, tar sands, tight oil, biofuels, and natural gas liquids such as propane) did indeed begin a gentle, continuing decline around 2006, and a peak for all petroleum liquids by 2015 is still likely though by no means certain. True, no peak oil theorist in 2003 was forecasting that US petroleum production would soar during the 2011-2013 period due to the hydraulic fracturing and horizontal drilling of tight (low-permeability) oil-bearing rock formations in North Dakota and Texas. But tight oil and tar sands are substantially different from the conventional resources that drillers targeted in previous decades: the former offer a low energy return on the energy invested in production (EROEI), require high rates of up-front investment, and imply increased environmental costs and risks. Tight oil wells show such steep production decline rates that a peak and sharp drop in output from the Bakken and Eagle Ford plays—which have driven the recent boom in US production—is probable in just the next few years. Meanwhile, the ongoing erosion of global extraction rates of regular, conventional crude means that an ever-larger proportion of total supplies must come from unconventional sources. Conventional oil, with its high EROEI and low production cost, fueled unprecedented levels of economic growth during the 20th century. That party is indeed over. On page 117, I summarized Colin Campbell’s view that “the next decade will be a ‘plateau’ period, in which recurring economic recessions will result in lowered energy demand, which will in turn temporarily mask the underlying depletion trend.” That forecast appears to have been spot on. Meanwhile, Daniel Yergin (of Cambridge Energy Research Associates) and other petroleum industry-friendly energy commentators now tell us that peak oil is nothing to worry about because, instead of a peaking of crude supply, we are instead seeing peak demand, as consumption of oil in the US, Europe, and Japan has fallen. Why? Yergin and company cite improvements in vehicle fuel efficiency, but in reality most of the reduction in oil consumption in the older industrial countries has come about simply because fuel prices are so high that people are driving less: they can’t afford to fill the tank as often. And prices are high because the only new sources of oil available to the industry are ones that are very expensive to develop. 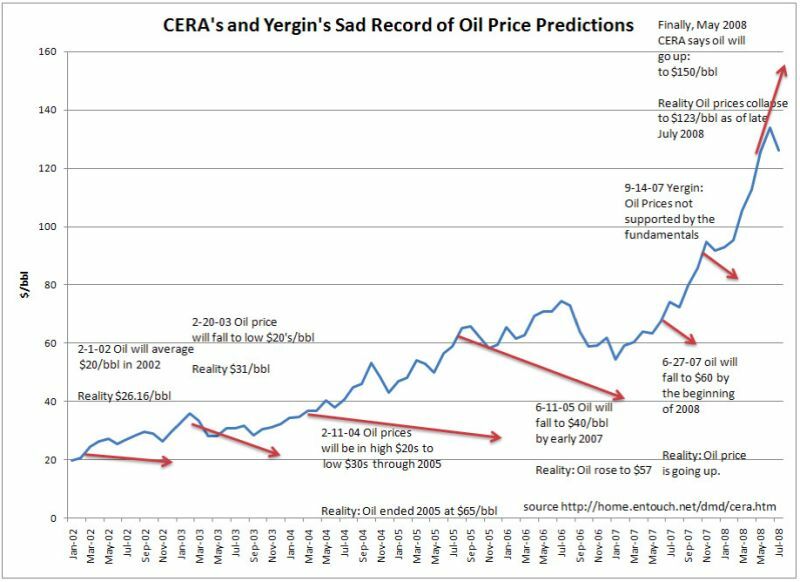 Analysts critical of peak oil failed to predict that petroleum prices would skyrocket to such an extent; indeed, during the past decade Daniel Yergin himself repeatedly (and wrongly) forecast falling oil prices [chart]. “Peak oil demand” appears merely to be a rhetorical device that admits the reality of peak oil implicitly while denying it explicitly. Meanwhile a comparison of forecasts by the peakists and their critics shows the former were generally far more successful in modeling oil production and price trends. The critics say peakists (like me) neglect basic economics: as oil prices go up, that makes more supply available. This is correct up to a point; again, no peak oiler I know specifically foresaw the scale of the current US tight oil boom. However, Campbell and Laherrère did clearly forecast that higher prices would promote the development of unconventional petroleum sources (that’s why Laherrère pegged the peak of “all liquids” several years later than the peak for regular crude). On the other hand, the peak oil critics themselves showed a lack of understanding of economic reality by ignoring the feedback between oil prices and the economy as a whole. Energy is what moves the economy; money is just a means of keeping track of wealth. Economics 101 tells us that supply of, and demand for a commodity like oil (which happens to be our primary energy source) must converge at the current market price, but no economist can guarantee that the price will be affordable to society. High oil prices are sand in the gears of the economy. As the oil industry is forced to spend ever more to access ever-lower-quality resources, the result is a general trend toward economic stagnation. None of the peak oil deniers warned us about this. The petroleum industry has undergone a profound shift in the past decade. Levels of investment in exploration and production have doubled, rates of drilling have likewise doubled, but output has risen only modestly—and all of the increase has come from costly, problematic, unconventional sources. The world’s ten largest publicly traded oil companies have collectively seen their production decline by more than 25 percent. And the industry has taken on far more debt: this is especially true for the smaller companies that specialize in producing tight oil. This industry transformation was completely unforeseen by the peak oil critics, but it is exactly what should have been anticipated by anyone who carefully read “The End of Cheap Oil” in 1998, or The Party’s Over in 2003. So much for Chapter 3. The following chapter discusses non-petroleum sources of energy, highlighting their various drawbacks and strengths. The section on natural gas requires substantial revision in light of the recent boom in US shale gas production (which I examine in my latest book, Snake Oil: How Fracking’s False Promise of Plenty Imperils Our Future); otherwise, aside from the need for a general updating, there’s little cause here for author embarrassment ten years hence. Chapter 5, “A Banquet of Consequences,” discusses the likely societal impact of peak oil. While some of the more alarmist peak oil authors who were blogging during the years 2005 to 2010 suggested (or seemed to suggest) that society would effectively collapse before decade’s end, The Party’s Over paints a picture of developments likely to transpire over a longer period, from now until about 2050. A decline in available, cheap oil will impact the financial economy, agriculture, and transportation. We’ve already seen some problems along these lines as a result of oil prices at over $100 per barrel; more are on the way. There’s not a lot here that needs revision ten years after the book’s publication. The final chapter, “Managing the Collapse,” offers suggestions for what individuals, communities, and society as a whole might do to answer the challenge of peak oil and to adapt to having less energy overall. If I were writing or re-writing this material today, I would point to recent efforts to prepare for the peak such as those organized by the Transition Initiatives or by the city-sponsored Peak Oil Task Forces of Portland, Oakland, San Francisco, and Bloomington. And I would cite several more recent books that do part or all of what this chapter attempted, but succeed more fully, elegantly, and entertainingly—such as Rob Hopkins’s Transition Handbook and Albert Bates’s Post-Petroleum Survival Guide and Cookbook. One possible criticism of the book: while it briefly discusses climate change, it does so at insufficient length. This issue now dominates just about all energy policy discussions and it deserved a more thorough treatment. Altogether, nevertheless, The Party’s Over fares pretty decently upon today’s re-reading—even if I do say so myself! What has been achieved in ten years by efforts to warn the world about peak oil? The book authors and bloggers who turned the subject of oil depletion into a cottage industry inspired hundreds of thousands—perhaps millions—of individuals worldwide to change their thinking, patterns of consumption, and expectations about the future. Some who read about peak oil changed careers or fields of study at university. We peakists also changed the energy conversation: peak oil has become a recognized term and concept. In a way, the current “Peak Oil Is Dead” campaign is a testament to our success: the petroleum industry’s public relations arm has been forced to expend resources putting out a fire that hardly amounted to a spark a decade ago. As a result of that campaign, even more people have heard of peak oil than before—though most probably have a highly erroneous impression of it. Resistance to the idea of peak oil has also come from mainstream economists. That’s because (as The Party’s Over explained on pages 169-172) peak oil effectively means the end of economic growth as we knew it during the 20th century. Growth is sacred to most economists: even credentialed insiders (economists like Jeff Rubin or investment fund managers like Jeremy Grantham) who question growth get pilloried by the priesthood. Politicians and businessmen love growth and hate anything that might call into question our ability to maintain it from here to eternity. For this reason alone, peak oil theory was destined for a public thrashing regardless of its accuracy. Some within the peakist movement now say the term “peak oil” has outlived its usefulness, and it is time to find new ways to name and frame the issues of resource depletion and energy scarcity. Others say we’ve invested years of effort in popularizing the term and we’re irrevocably identified with it anyway, so we simply have to do what we can to rehabilitate it. Either way, most peakists are pretty dispirited these days. Our public relations failure pales in comparison to our inability to achieve our real goal—which was to convince society to prepare for the end of the brief age of cheap, abundant energy. While individuals, a few organizations, and a handful of communities have indeed responded, the numbers are relatively small. National governments have done almost nothing. The best broad-scale policy would have been an international agreement to reduce production and consumption of oil in tandem (this idea was mooted as a proposal known as the Uppsala Protocol, the Rimini Protocol, or The Oil Depletion Protocol). But aside from resolutions of support from the Portuguese Parliament and city councils of Portland, Oakland, and San Francisco, there has been no real governmental interest in such an agreement. What have I learned from the past decade? That it’s hard to change the direction of society, but—given what’s at stake—that it’s worth trying. Knowing what I knew in 2003, I could not have lived with myself during the past ten years had I not at least attempted to alert the general populace and to change the thinking of policy makers. It’s impossible to foresee how far ripples will spread from the efforts undertaken to raise awareness about our precarious energy ecology. Even though society is still headed toward a wrenching collision with resource limits, educated and aware people have begun to build model low-energy alternative food, transport, and building systems that can support organized human life during the transition to a post-fossil-fuel future. How much more can be done in the time we still have? Let’s find out. For a book, it’s the end of a decade. But it’s not the end of the story.